A long waited Boss Adapter for the conversion of the proprietary Manfrotto® 490 and 050 series of Ball Heads in order to accept most Arca-Swiss® compatible Quick Release Clamps has finally been introduced by Desmond. Although Manfrotto has released the Q6 Top Lock Quick Release Adaptor Previewed last year, claimed to be Arca-Swiss® compatible, somehow in my Q6 Top Lock QR Adaptor Compatibility Assessment article it did not prove so compatible after all. Therefore, for the numerous Manfrotto ball head users, who wish to convert into a more practical QR system, the need of a true Arca compatible QR clamp system still remained. Nevertheless, there is a very sturdy and high quality dedicated solution coming from Hejnar Photo with the Hejnar FM496RC2 6cm QR Clamp which fits directly on the Manfrotto ball head stem, but its price and size are better matched with the larger of higher capacity and price 498 and 055 / 057 ball heads. Now Desmond with the DBAD-1 Boss Adapter did the obvious. A small, light weight and inexpensive accessory, which can fit any of the Manfrotto 494/496/498 - 054/055/057 ball heads, enabling them to be matched with almost any size, price and style Arca compatible QR clamp. DBAD-1 Boss Adapter dimensions are calculated to fit most Arca compatible clamps. The 1.5 mm (0.06") thickness of the disk, will not increase but actually decrease the overall height of the head, thus lowering the center of gravity. The top bosses meant to fit the anti-twist grooves, which are found beside the center mounting hole of most Arca style QR clamps, are 2mm (0.079") tall by 5mm (0.197") wide. However, the anti-twist groove size is the only prerequisite for the Boss Adapter to fit under the QR clamp of your choice. As mentioned above, all you need to check is that the adapter can fit into the clamp anti-twist grooves. For illustration purposes I have chosen the Desmond DBA-2 QR clamp not only for its very good quality/price ratio, justifiable even for a 494 ball head, but mostly for its dual capacity, being able to clamp both Manfrotto RC-2 and Arca compatible plates. The bosses on the other (bottom) side are designed to fit the ant-twist grooves found on the ball stem of the latest Manfrotto 494/496/498 and 054/055/057 ball heads. Like the 494RC2 ball head pictured above with the RC2 Quick Release removed. As a usual practice Manfrotto's ball heads have a proprietary anti-twist boss/groove design which is reversed compared to most other manufacturers. Mounting the DBAD-1 Boss Adapter does not require any special skills other than to unscrew the existing Quick Release using the provided Allen hex key and center the Boss Adapter within the wide anti-twist groove on the ball stem. Next obvious step is to center the clamp of your choice, or in this case the Desmond DBA-2 on top of the DBAD-1 adapter aligning the bosses with the clamp's anti-twist grooves. Either using the removed screw or the spare M6 stainless-steel screw provided with the DBAD-1, screw and tighten the clamp on the ball stem with the provided Allen hex key. That's all! Unique and innovative accessory at a very low price. Very good machining, finishing and anodizing quality. Good quality SS M6 screw included. None found up to now concerning the usage of the adapter. A very innovative and universal solution that will rejoice Manfrotto ball head users wishing to convert into the Arca-Swiss® compatible system. There is a great selection of QR clamps and manufacturers from whom a user can choose from. Further, the availability of the Desmond DBA-2 QR clamp, that is both compatible with the Manfrotto® RC2 and the Arca-Swiss® systems, helps Manfrotto users to perform a gradual transition without wasting their investment in RC2 QR plates. 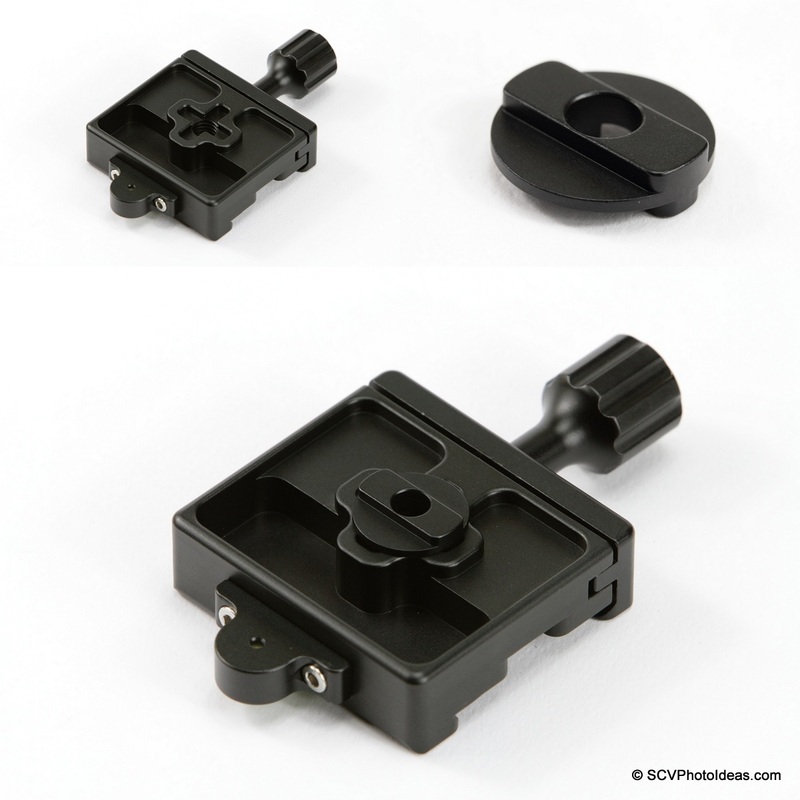 Note: The DBAD-1 Boss Adapter and the DBA-02 QR clamp presented in this article were kindly offered by Desmond Photographic Distribution, USA for evaluation and review. Current price for the DBAD-1 Adapter is US$ 7.97 which is also sold as a combo with Desmond DBA-2 Mnfrotto / Arca QR clamp for US$ 32.97 while both are available from Amazon and from eBay internationally.